Over a 5 year stretch, both of them were 22 runs better than the 2nd best pitcher." That was using a stat called RSAA or Runs saved against average. "It's the amount of runs that a pitcher saved vs. what an average pitcher would have allowed," as explained in the Lee Sinins Complete Baseball Encyclopedia. It is also adjusted for park effects. I then went on to show that Blyleven was comparable to Koufax in strikeout-to-walk ratio and HRs allowed when park effects were factored in. Blyleven may have been a dominant pitcher during that time and no one really noticed. I used data from David Pinto's Day-by-Day Database. 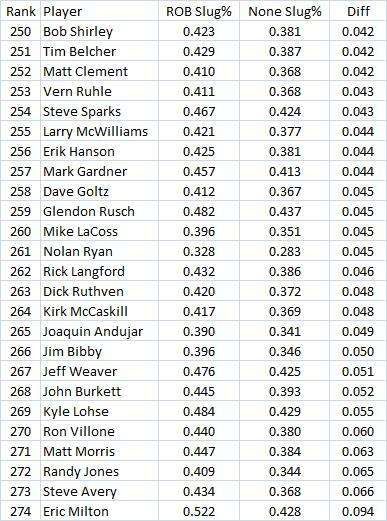 I found all the pitchers who had 2500+ PAs with runners on base (ROB) and no runners on (NONE). There were 274 pitchers. 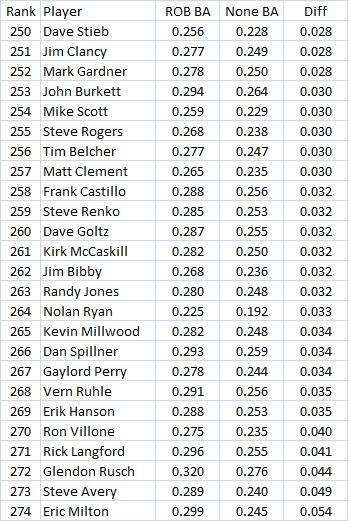 The correlation between the batting average (BA) allowed with ROB and BA allowed with NONE was .723. For slugging percentage (Slug%) it was .740. Those are both fairly high. But I did expect it to be even higher based on some recent posts where I compared BA differential and Slug% differential between the two cases for consecutive years were extremely low. That suggests very little ability to pitch to the situation. 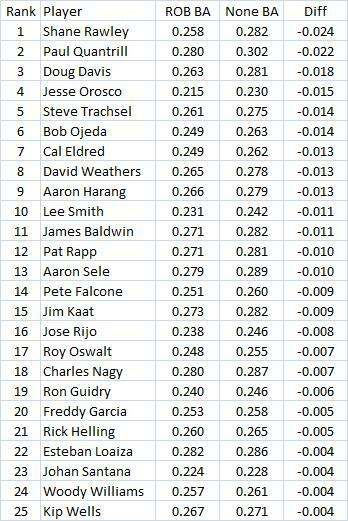 The table below shows the 25 best pitchers in terms of lowering their BA with ROB compared to NONE. The next two tables are the worst pitchers. That is, they gave up a higher BA and Slug% with ROB than with NONE. "There is definitely going to be a different look. The Padres made a major transition midway through the 2009 season. It has transitioned again. I like this team. The focal point of last season was always Adrian (Gonzalez). We’re more balanced. That balance has to make up for the loss of Adrian." That will be tough to do since in the last two years Gonzalez finished 4th and then 2nd in WAR with 7.0 and 6.3 (from Baseball Reference). Black said they will be improved elsewhere. That might make up for losing Gonzalez, but it does not have anything to do with balance per se. Are "Balanced" Teams More Successful? I found balance helps very little, if at all. I also have links to research by Keith Woolner and David Gassko at that first site. It looks like their research shows that at most better balance can add 1 per season. So if Adrian Gonzalez's replacement costs the Padres more than 1 win compared to him, the balance will not help, as Black says. That is assuming that they actually are more balanced. Part 1 was a couple of weeks ago, when I only looked at one pair of years. I have now done 5 pairs of years. 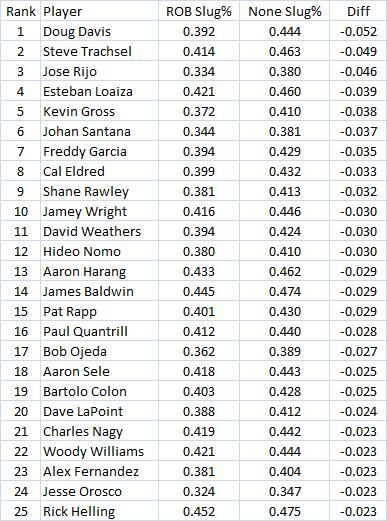 Low correlations indicate that pitchers tend not to be clutch one year and again clutch the next year. 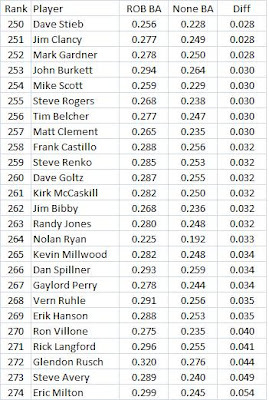 I looked at all pitchers that had at least 250 plate appearances against opposing hitters in both of five consecutive two-year periods both with and without runners on base. There were around 70 such pitchers in each of the five cases. Data from David Pinto's "Day by Day Database" which is based on Retrosheet. I found the differential between the batting average they allowed with runners on base (ROB) and the batting average they allowed with no runners on (NONE). I did the same for Slug%. 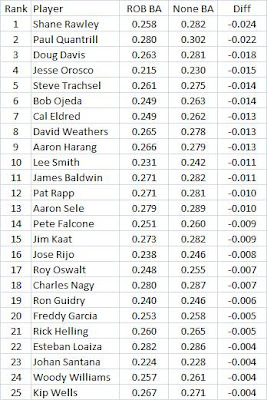 So if a pitcher allowed a .240 BA with ROB and a .260 BA with NONE, his differential was -.020. That means he did better in the clutch than otherwise. Did pitchers maintain about the same clutch performance in each year? Probably not. 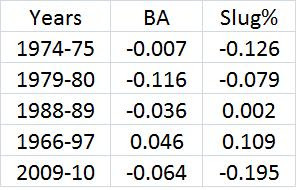 The table below shows the correlation between the first year's differential and the second year's differential for both BA and Slug%. They all tend to be pretty low or negative. 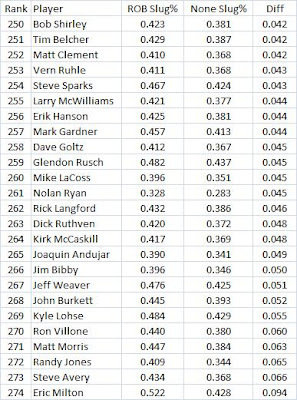 If a pitchers in general tended to have about the same differential in each year, the correlation would be much higher. That is what I would expect if they really had a constant ability (or inability) with runners on base. 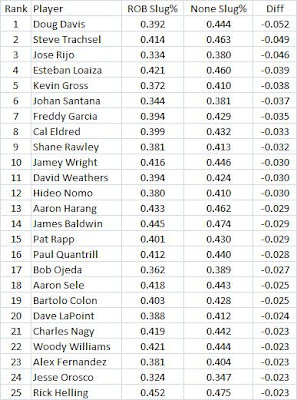 But what this means is that many pitchers have a good differential one year and a bad or mediocre one the next year. In both cases, with runners on and with none on, there is a large number of PAs. So if there really is some clutch ability here, we should see it. Also, pitchers, unlike hitters, can actually bear down and throw a little harder with runners on (or try harder to break off good curve balls). A batter really can't swing harder, for example, depending on the situation. But pitchers could save a little extra for when they needed it with runners on. Batters probably don't save a little extra. So the one group that could theoretically have some control over the clutch don't seem to have it even when looking at a fairly large number of observations.